Hello! It’s been a good day so far today. The sun is finally shining in Somerset (after what feels like weeks of rain) and I’ve just launched a new product. I love designing stationery, particularly Children’s stationery as I feel it allows me to be extra playful with my designs. All of my designs derive from hand drawing, later to be skilfully manipulated on the computer, printed, photographed and listed on my two online shops (Etsy and Notonthehighstreet). There is only one person employed at Rosefinch Studio (good old me), meaning it can often take some time for new products to be launched. 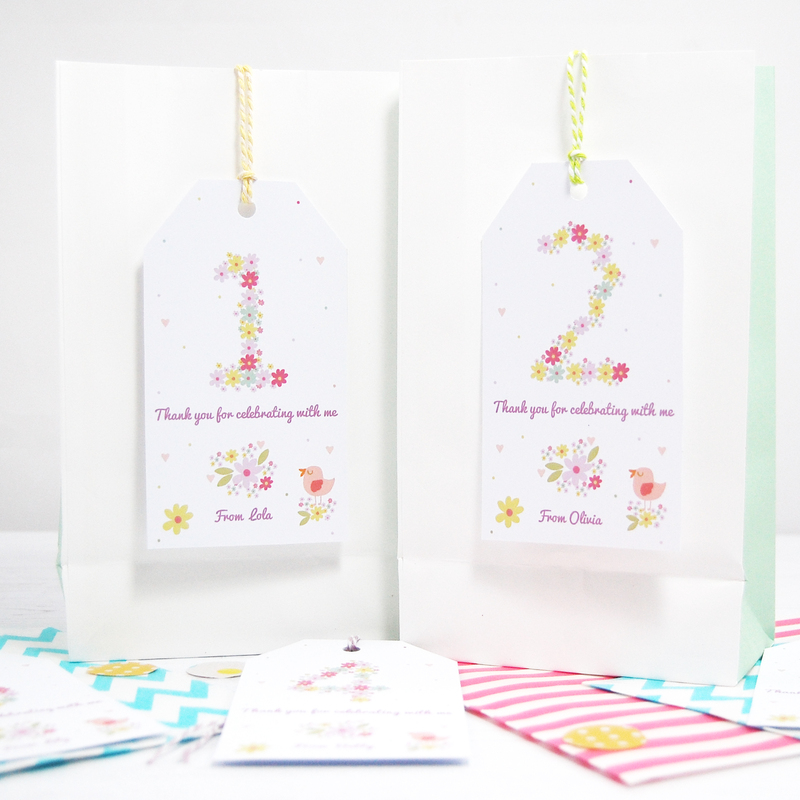 These ‘Personalised Children’s Party Bag Thank You Tags’ may just be one of my most favourite products yet, I just love how pretty they are. If you’re wondering what their exact purpose is, let me explain. Typically at children’s parties, theres a tradition of giving party bags to their friends as a thank you (and for transporting left over birthday cake in of course). 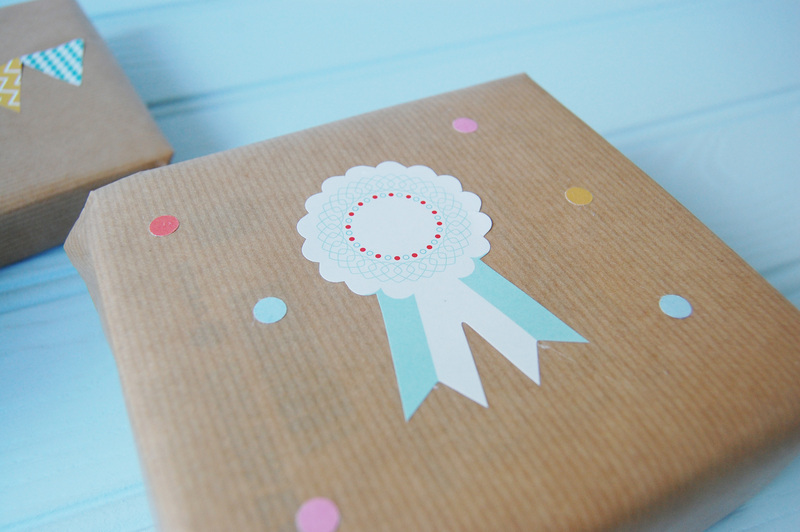 I thought it’d be really lovely to offer personalised gift tags complete with twine for adorning such party bags. 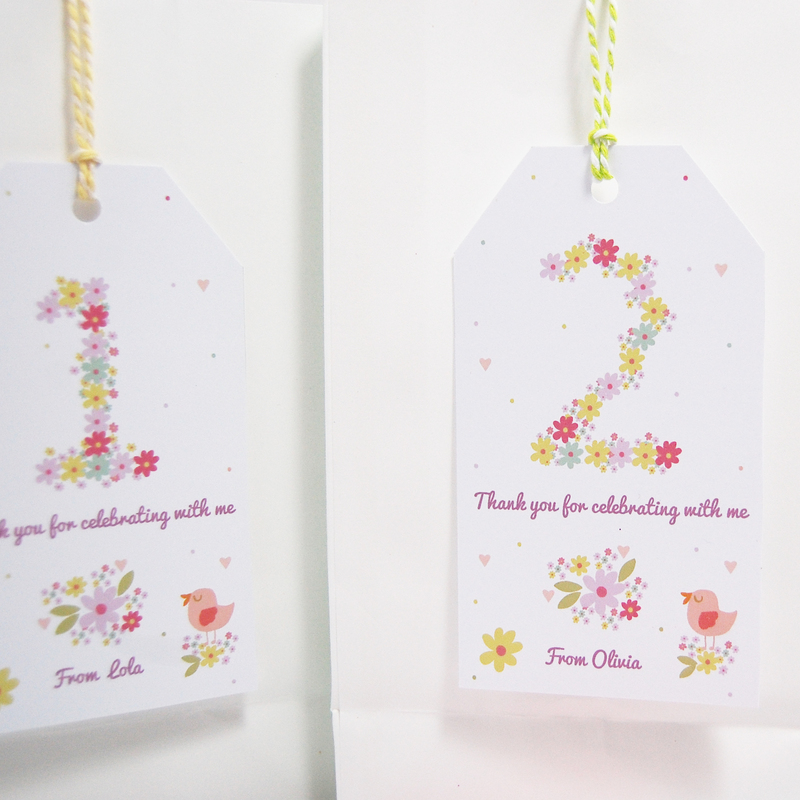 My party bag tags can be personalised which definitely adds a unique touch. The large number at the top of the tag represents the child’s age. There’s a sweet message underneath that (which can also be personalised), thanking their friend for celebrating their birthday party with them, followed by a ‘from’, allowing the birthday child to include their name. Each tag comes complete with twine, available in a variety of colours. As you can see, the tags are very floral. The hearts and polkadots look very pretty surrounding the flowers and the bird seen perching on the flower cluster finishes the design off I think. 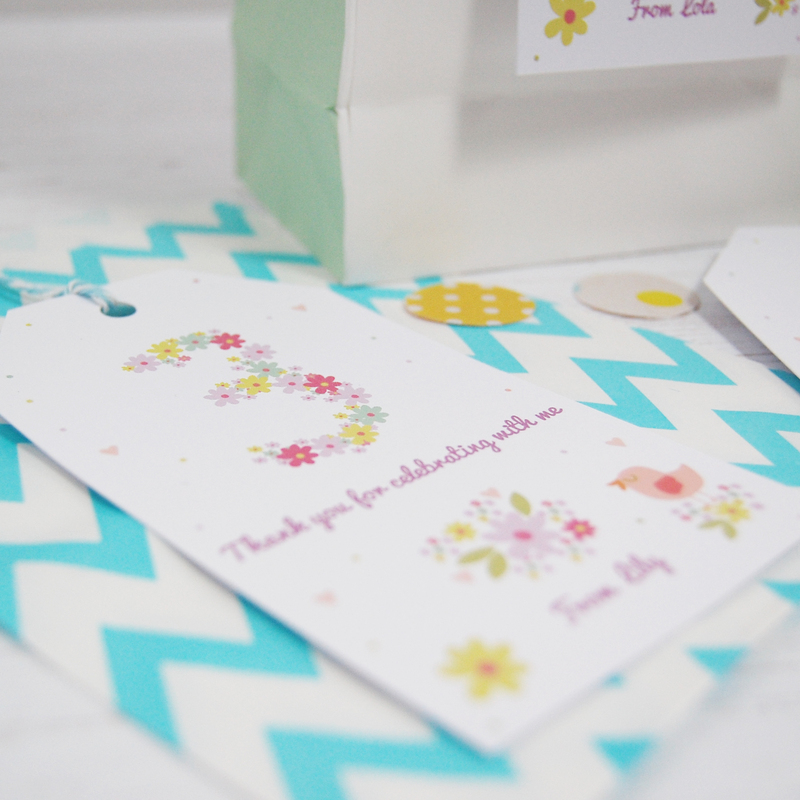 My next plan is to extend my range of gift tags as I really enjoyed designing and producing these. You just don’t seem to see anything of this kind in mainstream shops, which to me, makes it very desirable as I love unique products. What are your thoughts? I’d love to hear from you! Do you have a party coming up? If so, happy party planning and feel free to have a browse in my Etsy and Notonthehighstreet shops for personalised party products. Anybody who knows me well, knows that I absolutely love crochet. I taught myself to crochet several years ago and have been happily ‘hooking’ ever since! I just find it so incredibly therapeutic (unless of course I’m following a very tricky pattern) and I love how easy it is to add colour. I run a local, fortnightly crochet group in a cafe, so a lot of tasty cake and warm hot chocolate was consumed whilst this was made. As Easter is coming up, I thought it would make the perfect garland. I’ve made quite a few crocheted party decorations similar to this and I always have so much fun with them. 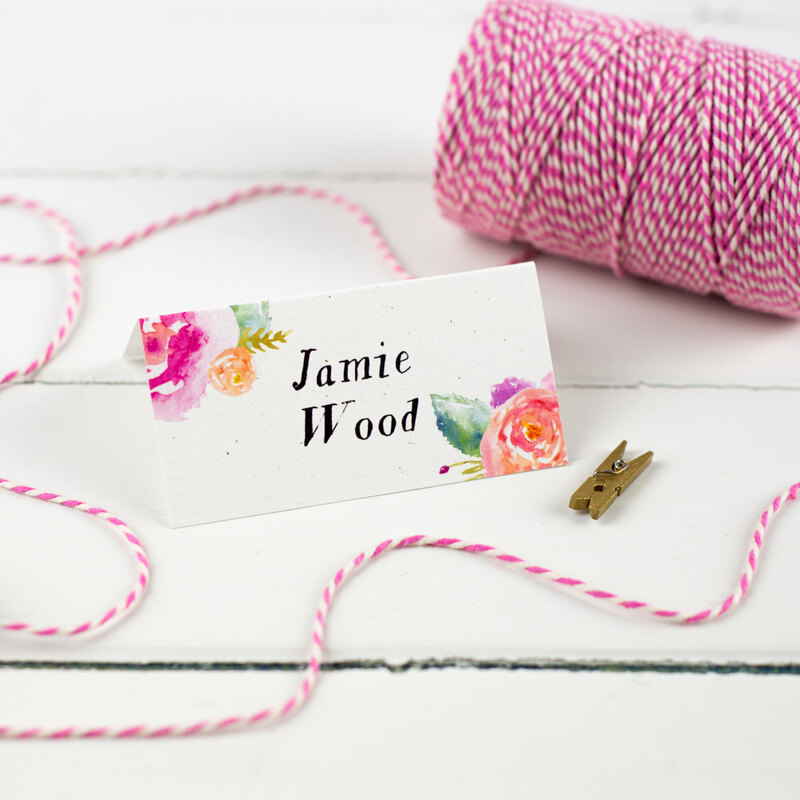 Pastel felt flower gift tags with pink twine, need I say any more? 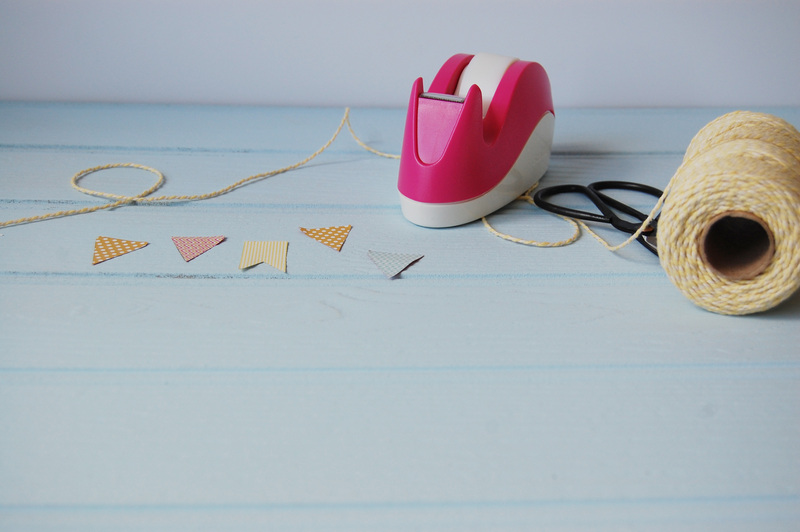 Rachel spends a lot of time in her craft room and plans to use these as organisational tags for all of her crafty bits. The felt flowers were all cut by hand by myself. I drew a brief outline of each flower on thin paper to start with to use as templates. After choosing the felt and cutting out each shape, I used a mixture of hand sewing and hot glue gun, with some added embellishments. 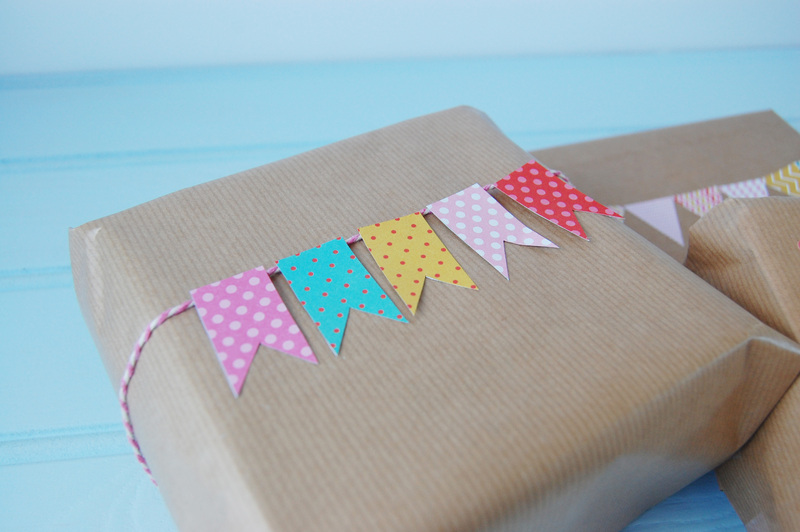 The brown gift tags came from my local craft store and were the perfect colour, as the pastel colours really shine through against the background colour. Rachel and I agreed on three items, the third being these tall, patterned heart cake toppers, perfect for decorating beautiful cakes with at special parties and events. This wrapping paper I used to wrap the gifts in was perfect, as it felt so seasonal. 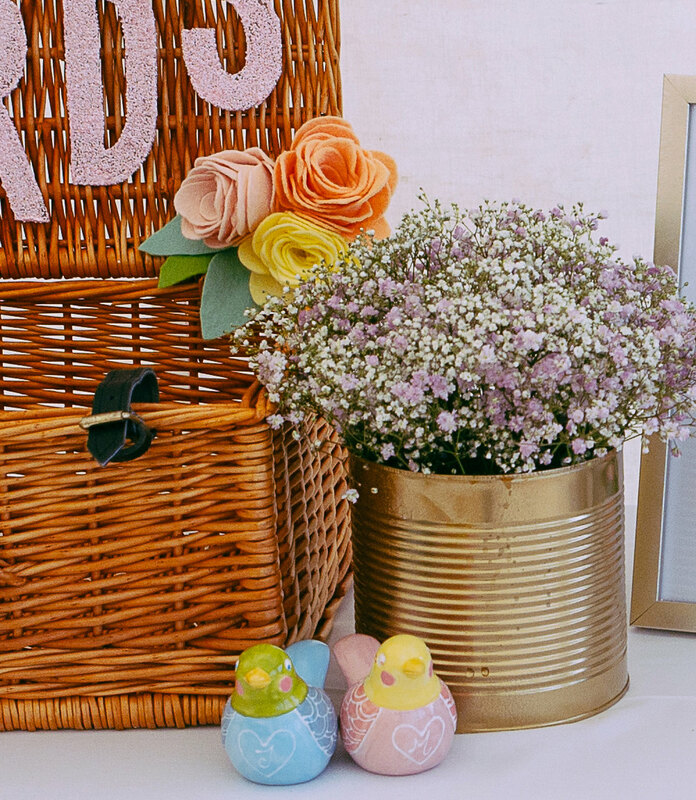 The Spring like colours and delicate flowers stood out to me whilst choosing the wrapping paper and the pink twine was the perfect addition! These fabulous handmade gifts were Rachel’s craft swap to me. How stunning are they? I love each and every one item Rachel sent and was so overwhelmed that they were created with love especially for me. I’ve now placed the gorgeous padded heart garland in my kitchen. The patchwork needle case is displayed proudly in my craft room next to my sewing machine. It will definitely be used as I’ve been thinking about teaching myself to make patchwork quilts and accessories for some time now. Rachel also included a beautiful handmade coaster for all of my lovely mugs and look at that little rosette! Last but not least, Rachel has an adorable dog named Wilson, so I couldn’t leave him out. I have two miniature poodles named Felix and Mabel, and they both love Lily’s Kitchen bedtime biscuits. They are the perfect treat for lucky pooches! 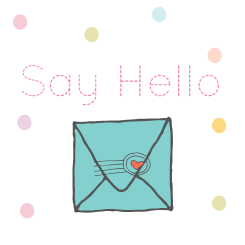 I hope you’ve enjoyed reading and do get in touch if I’ve inspired you! Have a lovely week. If you’re a regular reader you hopefully enjoyed last weeks Wedding Wednesday post, completely dedicated to wedding stationery. 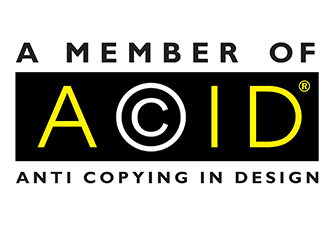 Due to the fabulous feedback received, I’m pleased to be featuring more inspiring designers in this weeks instalment. Thinking back to last year when I was planning my own wedding, I remember sending my cake decorator endless Pinterest links containing lots of amazing wedding cakes. I eventually found an absolutely stunning handmade cake topper to go alongside the beautiful cake, which I wrote all about here. The cake decorator took full inspiration from my cake topper and designed the cake around it. How amazing is that? I absolutely love browsing the web for wedding related decorations, so it only felt right to feature some of the most stunning cake toppers on my blog. 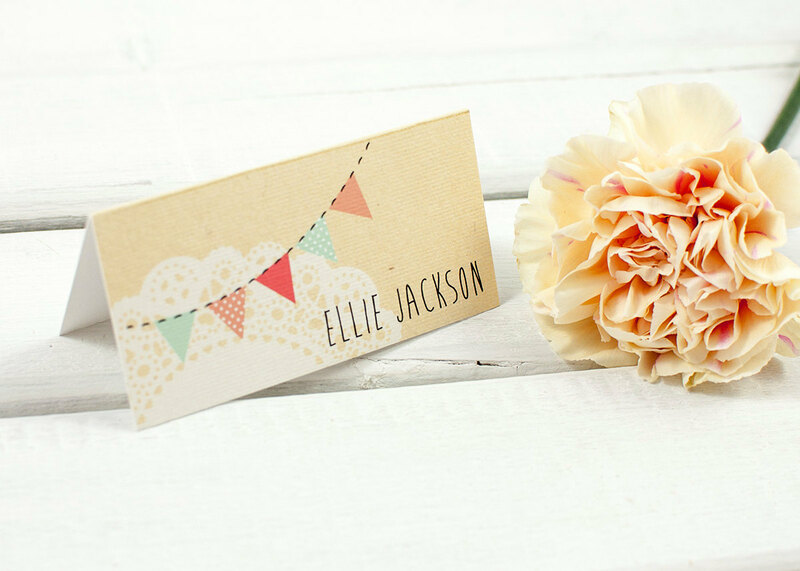 Pictured above, are two amazingly adorable wooden peg cake toppers, handmade by Rose at Blossom Cake Toppers. 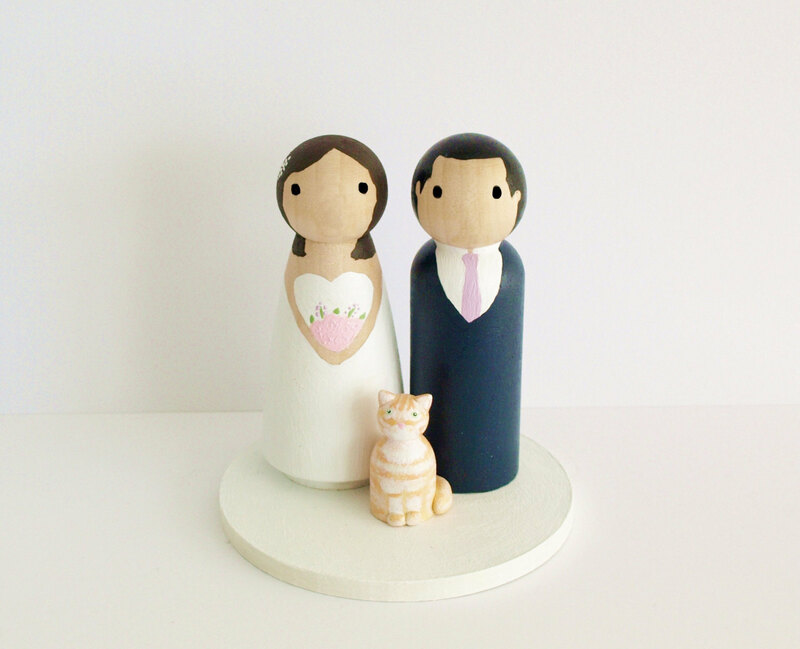 These cake toppers are hand painted with plenty of love and care and are fully customised to look like the happy couple. This really is something that can be cherished for a very long time and will always bring back memories of your special day. I would be very happy to proudly display these cake toppers on my dresser, showing them off a million times over. Yes, really! When my husband and I got married last year, we didn’t have Felix (our miniature poodle) at the time, but if we did I definitely would have liked to have seen him in hand painted peg form, thats for sure. 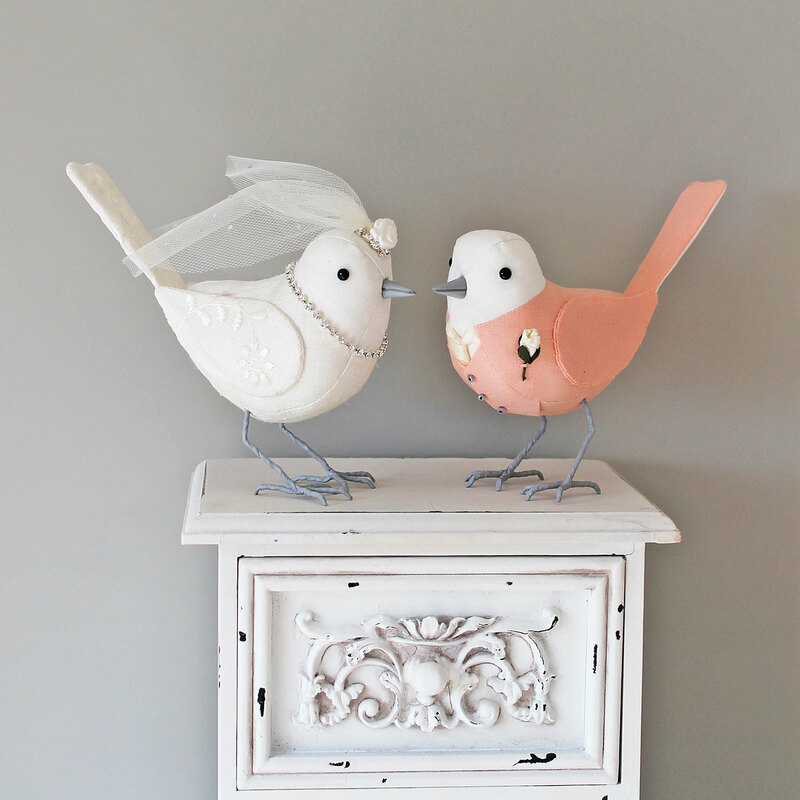 Next on the inspiration list are these wonderful fabric wedding birds, beautifully handmade by Emma at The Cotton Potter. Can you imagine these sitting pretty on top of your special cake? I certainly can. Emma’s birds are all completely handmade and are made to order. Each bird is carefully sewn together from Harris tweed and other pure wool fabrics. 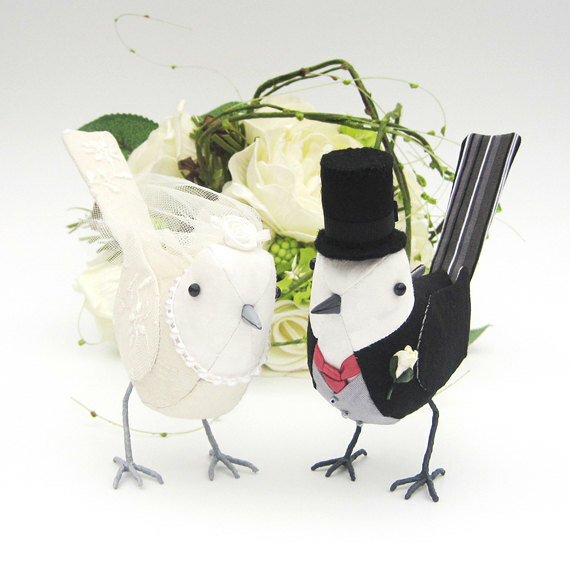 Having your birds individually designed means that your cake topper will be completely unique and truly special. How exciting does that sound? Emma’s attention to detail is beyond words and her photography completely brings her fabulous creations to life. I imagine any wedding photographer would have plenty of fun photographing these, and you’re bound to want to display these for years to come, as you would with Rose’s peg cake toppers above. Please tell me you’re feeling inspired now? If so, you’ll definitely enjoy the rest! This marvellous creation above is made by Louise at Pops of Colour. Who doesn’t love confetti? Have you ever thought of having a confetti wedding cake topper? It’s something I would absolutely consider if I could plan my special day all over again. It’s such a fun idea and such a great way to bring lots of bright colour into your decor. 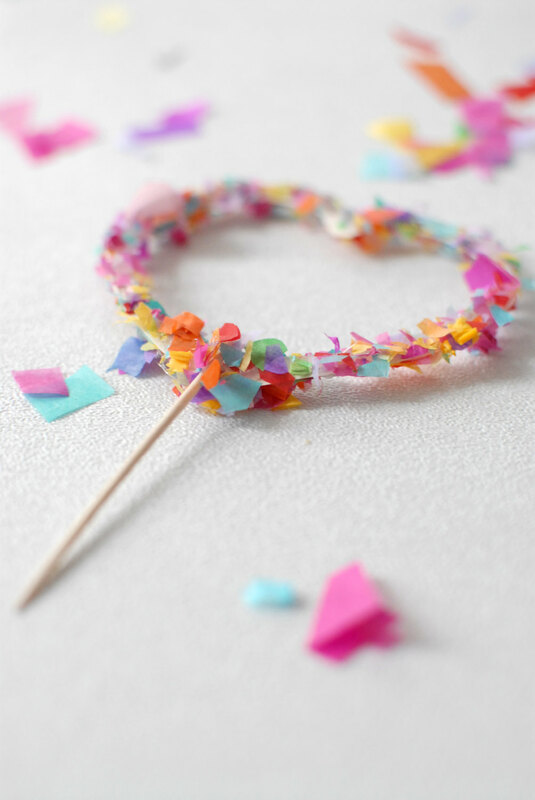 Louise offers a choice of colours, meaning you can customise your confetti in accordance with your wedding theme. You can also choose from a range of confetti letters, so if you feel like having a ‘Mr & Mrs’ or ‘Love’ cake topper, it just might be possible! Yay! How awesome? You’re noticing a theme here aren’t you? More birds! Why not? These beauties are lovingly handmade by Manmeet at White Rain Designs. 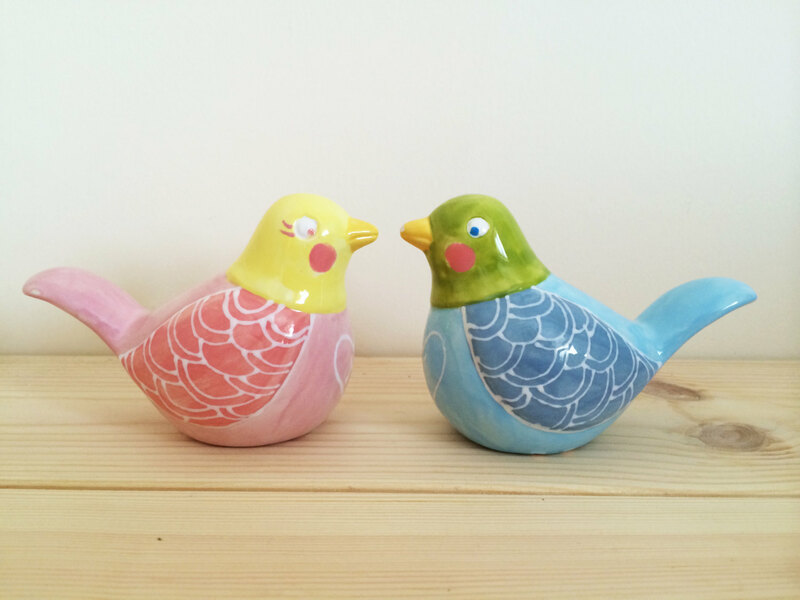 These ceramic songbirds can be personalised to match your wedding theme. You can even add your own initials. All of Manmeet’s products are designed and painted by herself using earthenware ceramics and non toxic paints and glazes. I for one adore bright colours and anything personalised, so these would definitely suit me to the ground. How about you? Last but certainly not least, are these utterly adorable hand sculpted ‘love mice’ cake toppers, made by Natalia at Heartmade Cottage. Natalia uses polymer clay and offers a selection of finishes. 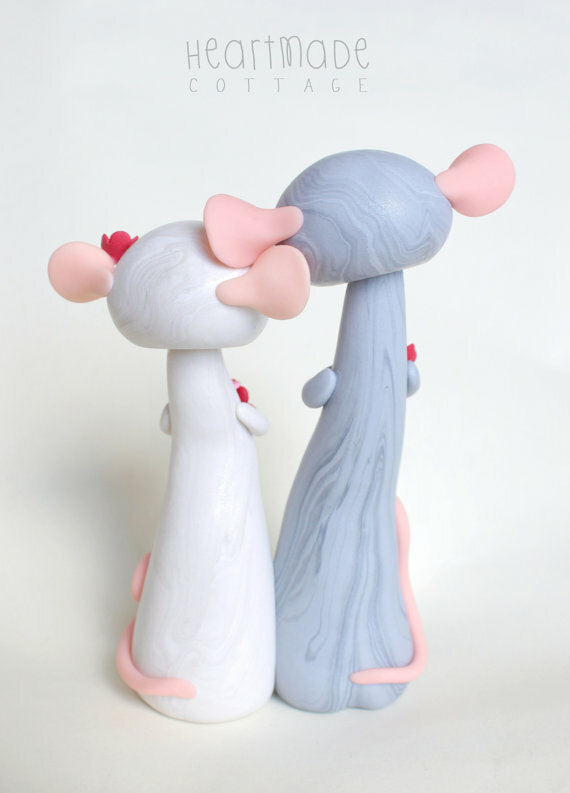 Each item is handcrafted to order, meaning your mouse couple will be one of a kind. I love the sound of that! Don’t you think they are absolutely adorable? Did you let out a little squeal of cuteness? I certainly did. I really hope this post has inspired you and given you plenty of wedding cake topper ideas. 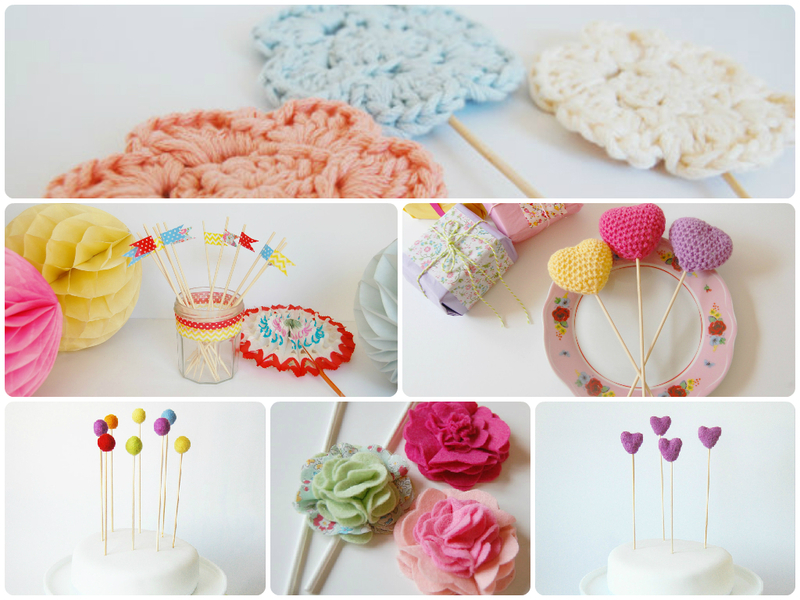 If you’ve clicked through to Paper Doily Party Shop before, you may have noticed that I absolutely love making cake toppers myself and offer a very colourful selection of them, all lovingly handmade in my home studio in Bath, Somerset. I’ve made cake toppers for many happy couples and it’s such a wonderful feeling to know that my creations have been part of lots of amazing wedding celebrations across the globe. I have no doubt that the wonderful designers featured above have experienced the same feeling. I hope you’ve enjoyed reading and please let me know if you’d like to be featured on Wedding Wednesday’s, I’d love to hear from you. I’ve decided to start an exciting new blog feature which you’ll see from the title. If you’re a regular reader, you’ll begin to notice that Wednesday’s will be entirely dedicated to weddings, which will give me the perfect opportunity to feature some of the most talented wedding designers and craftspeople out there. After planning my own wedding last year, I will admit that I really miss browsing through inspirational wedding photographs and products, and creating endless Pinterest boards. I may have been creating three or four boards a week at one point! Those who are married have all been there right? Do tell me yes!? I must mention that I’m very happily married, but these blog posts will rather selfishly allow me continue to fulfil my wedding planning desires, whilst inspiring many other soon-to-be weds. Win, win all round, right? 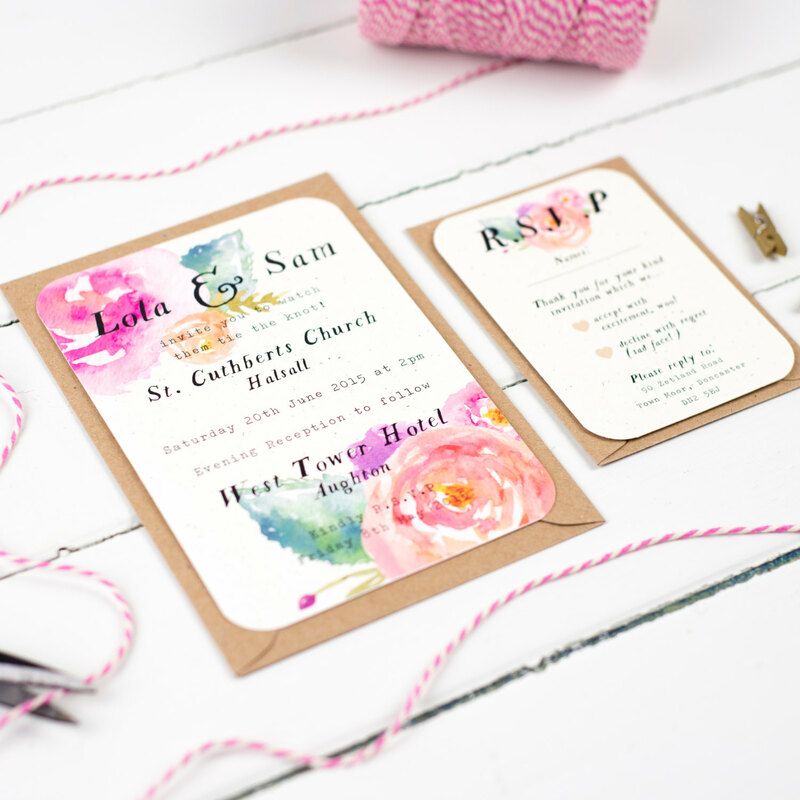 This week is all about wedding stationery. It’s a vital part of any wedding celebration and in my experience, one of the first items I purchased after finalising certain aspects of the day. 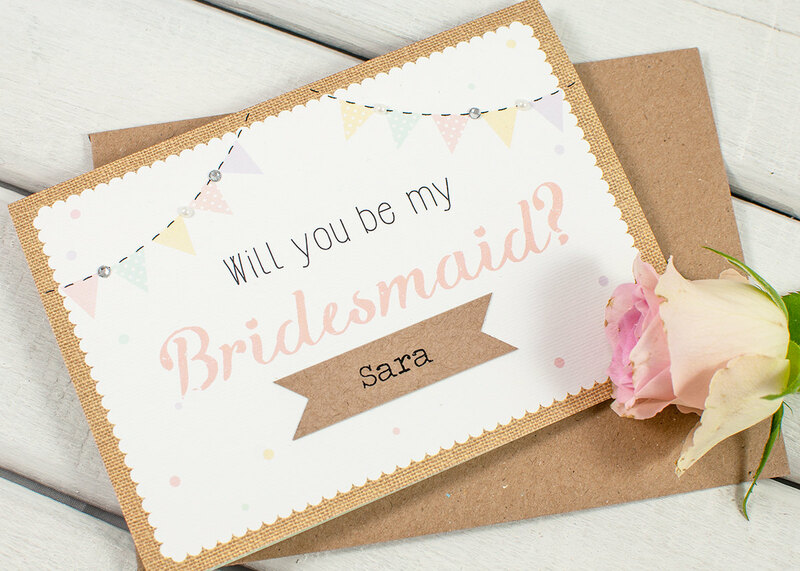 There are so many wedding invitations out there, how do you even begin to narrow the choice down? The best thing about Nina Thomas Studio, is the amount of options available. There’s bound to be something you love in her collection… or in my case, I love everything and would find it a rather large task to choose. 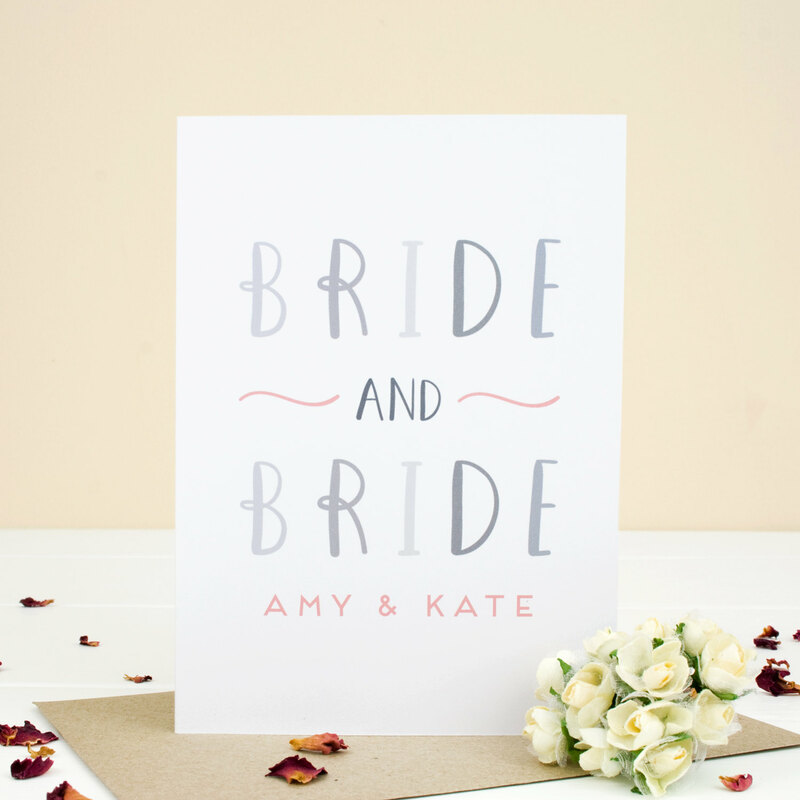 Nina Thomas Studio specialises in vintage inspired wedding stationery and paper goods. Her Summer Bloom collection, featured here, is one of my favourites. 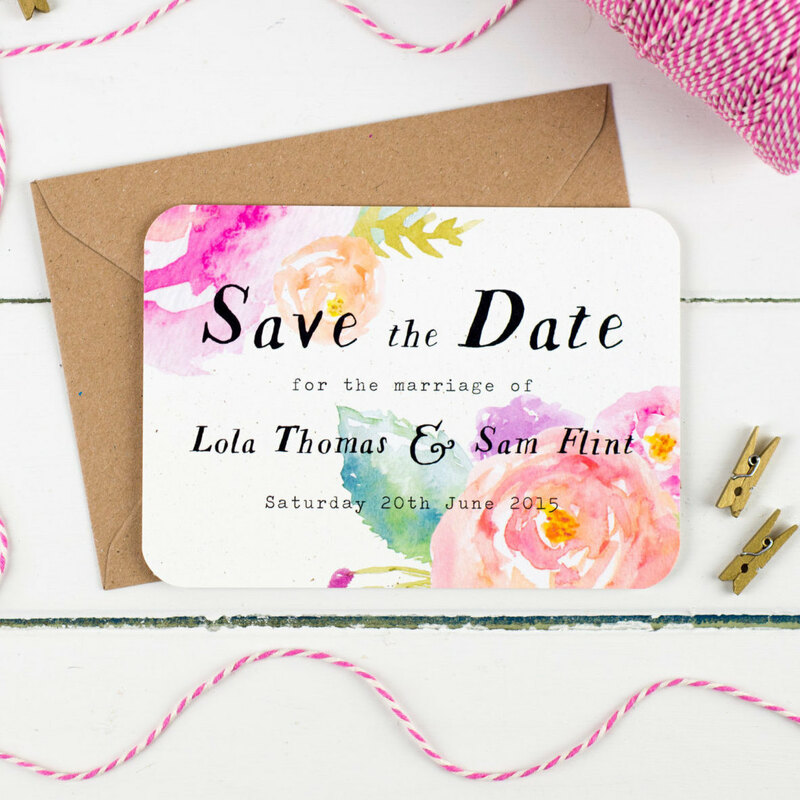 We’ll start with the save the date cards as they are pretty important, right? The painterly effect is just stunning. The colours are fresh and beautiful, the collection is styled in an incredibly inspiring way and the font makes the whole design look pretty dreamy. Do you agree? The Summer Bloom wedding invitations, RSVP cards and place settings are also absolutely gorgeous. What a remarkable collection. 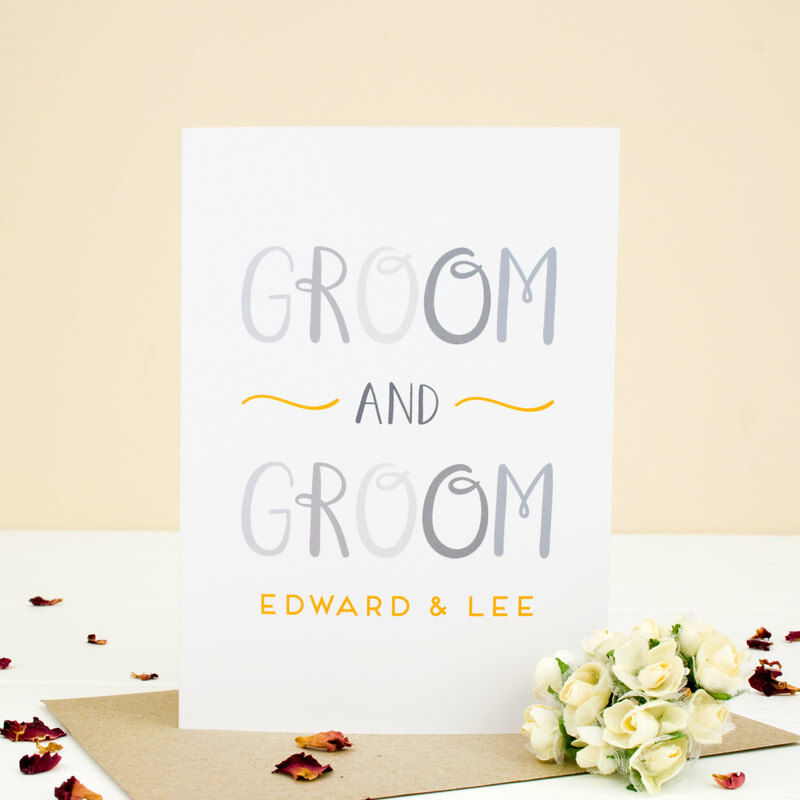 Next on the agenda is an amazing selection of wedding stationery, designed by Norma & Dorothy. Norma & Dorothy offer an outstanding selection of handmade wedding stationery of a very unique, whimsical and rustic style. 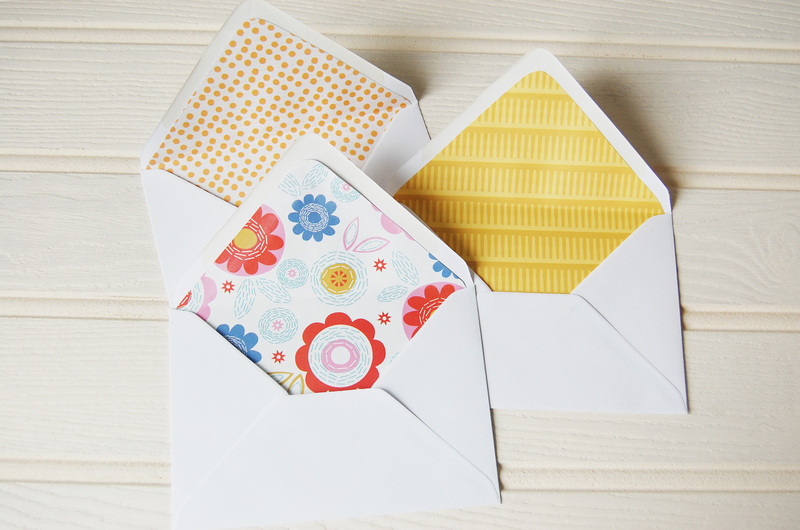 The surface pattern designs presented on these cards are so inspiring. 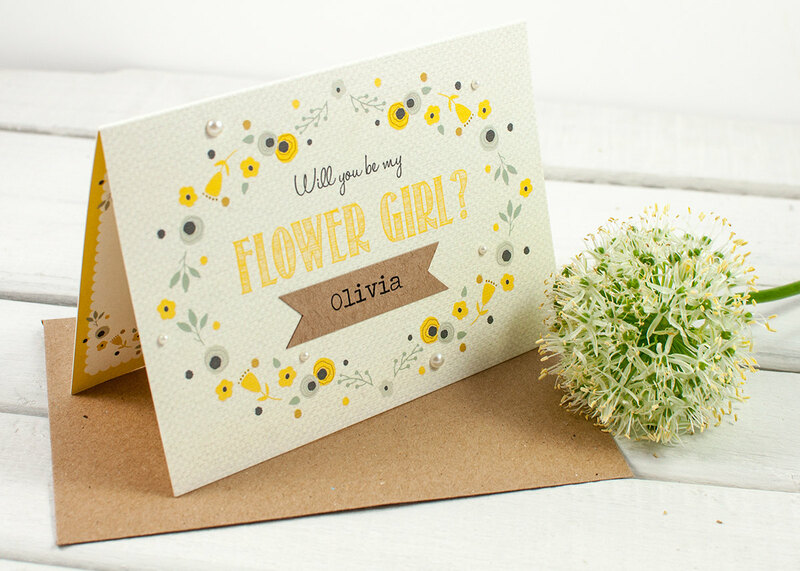 There are many flower girl and bridesmaid cards available in the handmade marketplace, but these ones offer a very special, personalised touch, particularly by including the recipients name on the front. These are the type of cards of which I for one would cherish forever and I’d also be very proud to send them to my family and friends. 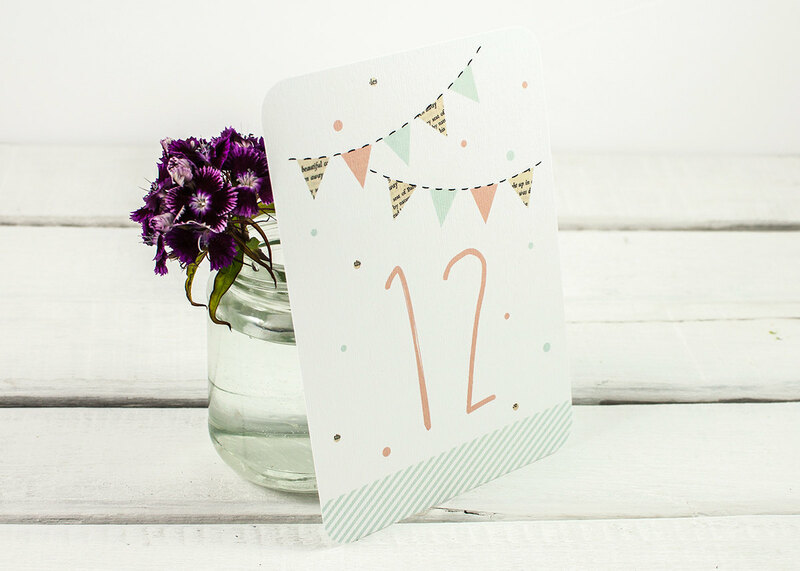 The place name cards and table numbers pictured above, also designed by Norma & Dorothy are the perfect addition to your wedding table, if you happen to be a bunting and doily addict like myself. You may have noticed from the features above, that I have a rather large soft spot for hand painted stationery and lettering. 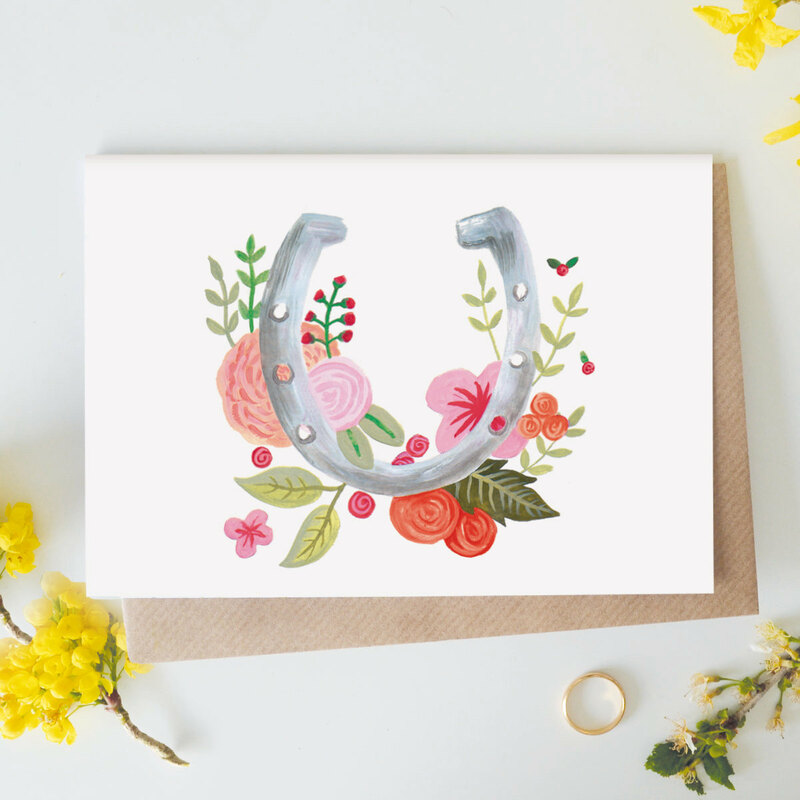 Jade Fisher specialises in sweet and simple stationery and is the amazing illustrator of these greeting cards. I can clearly see that these have been designed with so much love and attention to detail. 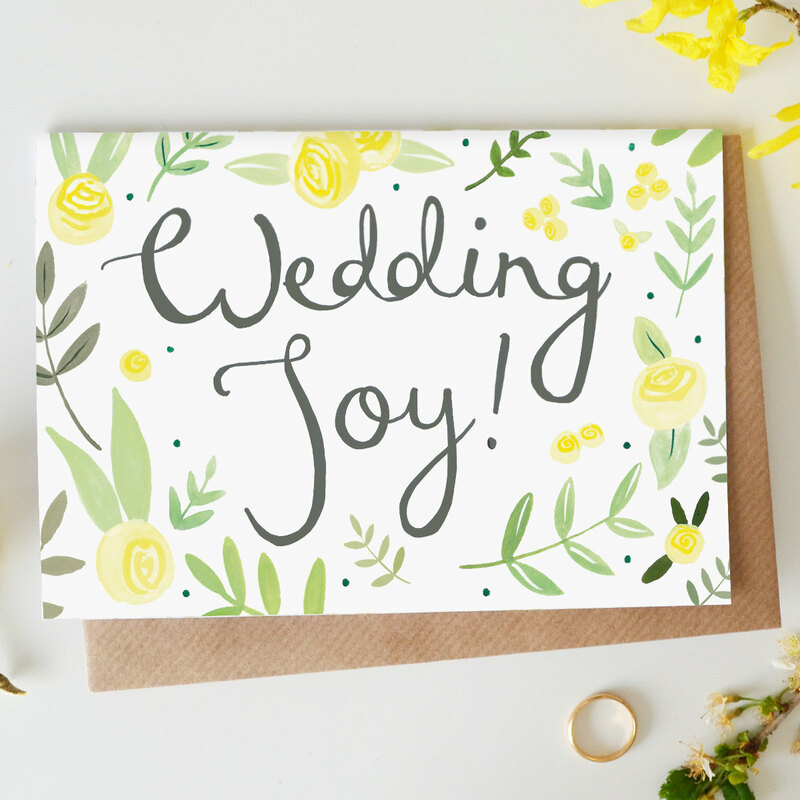 Greeting cards are a very important part of any wedding celebration, and what better way to send your love and best wishes? The colours used by Jade, work brilliantly together and Jade’s photography always makes me want to dive straight in and purchase everything! Are you experiencing the same effect? It certainly wouldn’t suprise me! Last but absolutely never least, are these awesome greeting cards designed by Joanne Hawker. I love how the cards can be personalised to feature the special couple’s names. 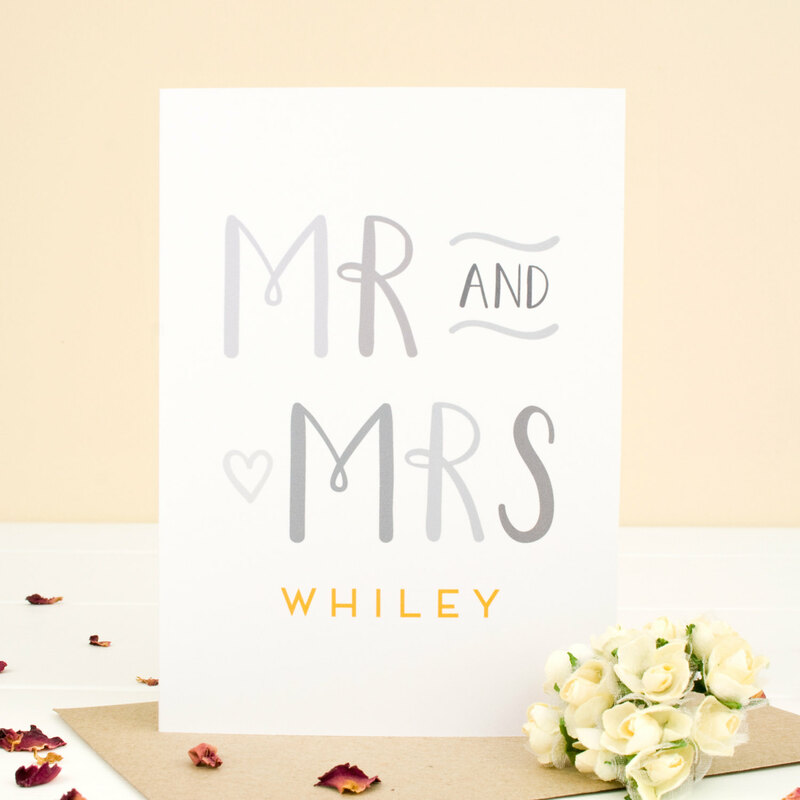 As Joanne very rightly explains, they are perfect for congratulating the happy couple, and I personally couldn’t think of a nicer way to do so, how utterly sweet! 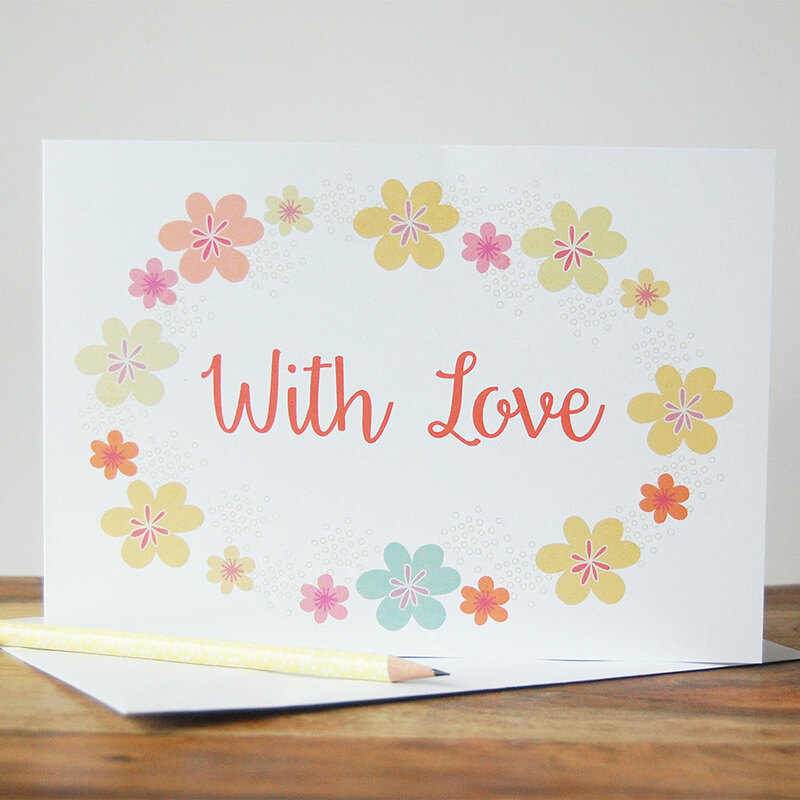 These greeting cards are simple, yet very effective. Something which is often quite hard to create. Are you feeling fully inspired now? I really hoped you’ve enjoyed this weeks instalment of Wedding Wednesday. As cheesy as it may sound, I’m thinking it’s one of my best ideas for the blog as of yet, and will hopefully inspire many happy couples out there. Would you like the be featured in the next instalment of Wedding Wednesday, or can you recommend a special someone I should check out? If so, I’d love to hear from you. In the mean time, you may like to have a browse through my own stationery collection which is sold on Etsy and Notonthehighstreet. 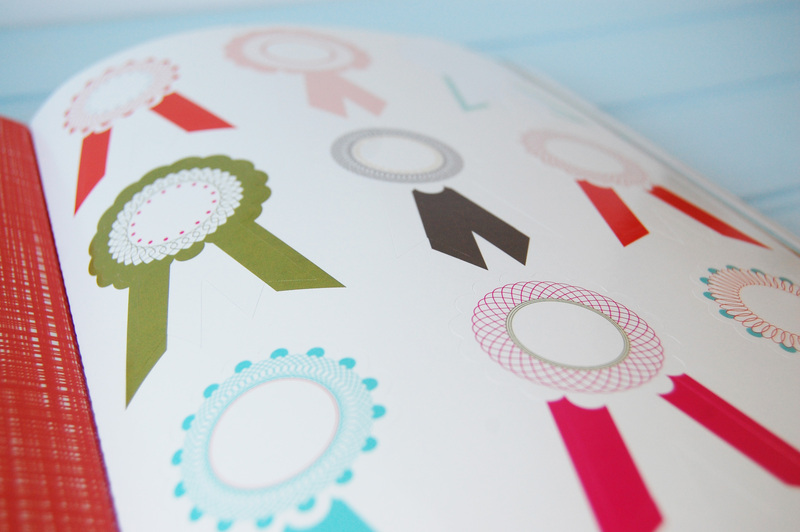 I offer a lovingly designed range of cards and stickers, which are all designed in my home studio. 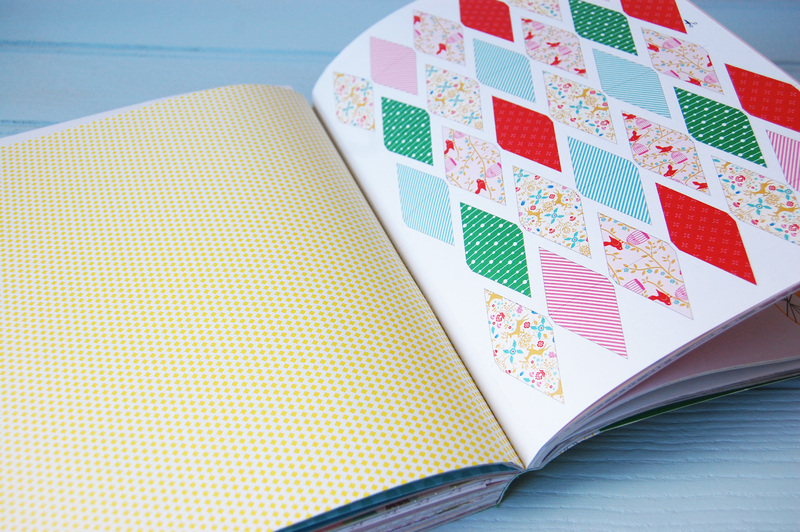 Here is a sneaky peek! 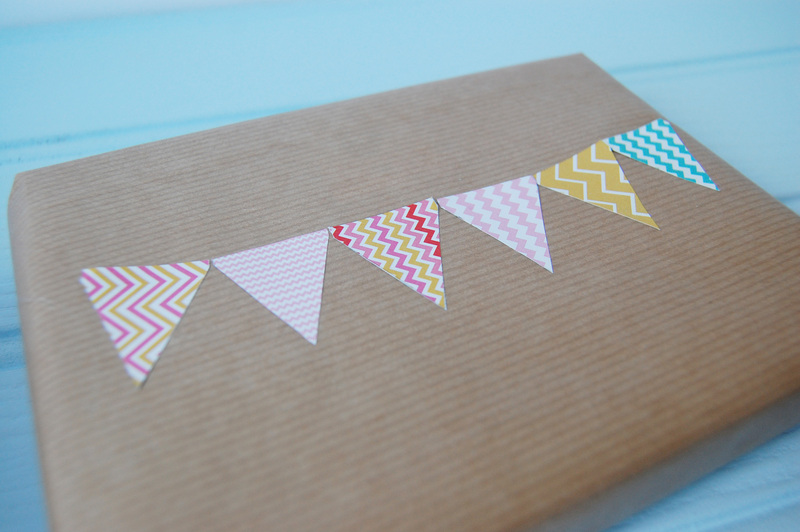 Beautiful envelope liners seem to be cropping up everywhere at the moment and I can definitely see why. 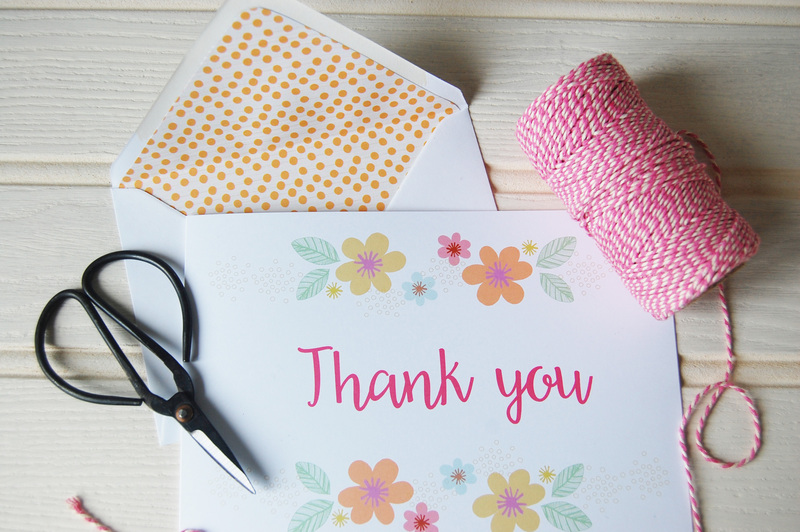 If you’re anything like me and love print and pattern, they provide the perfect opportunity to compliment your cards, letters or invitations. 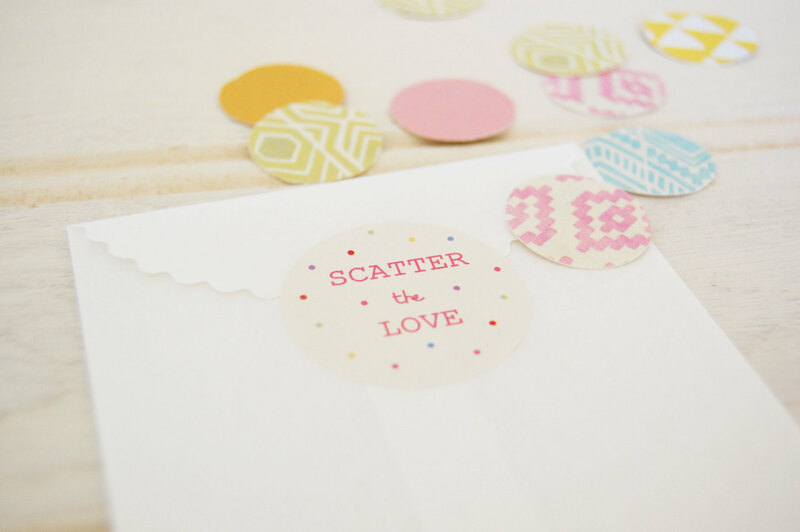 They are perfect for extra special party or wedding invitations. In fact, I received a beautiful wedding invitation last week which contained an envelope liner. 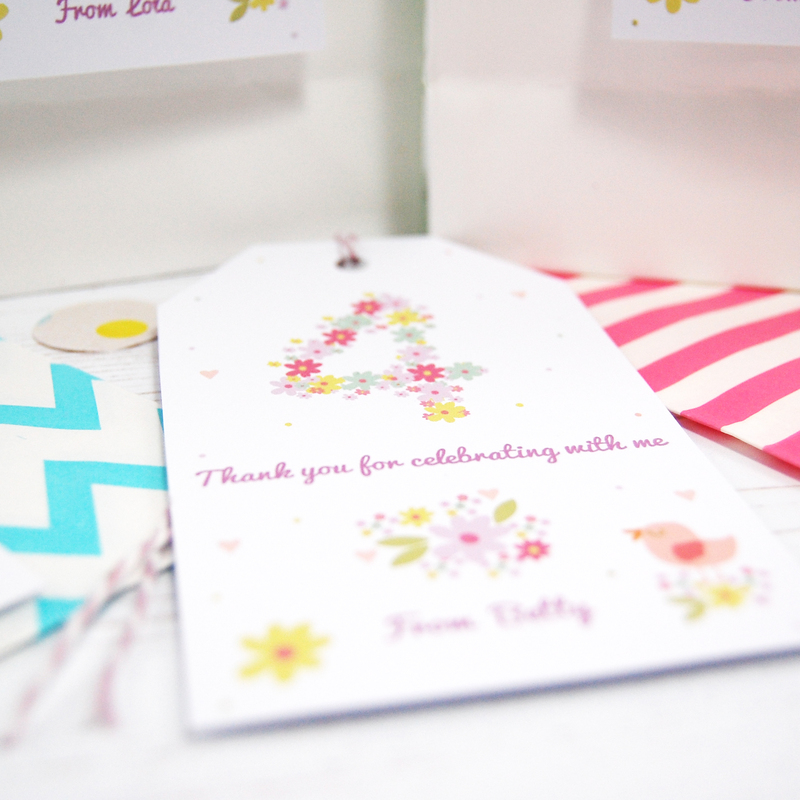 It created a very large smile and just felt so much more interesting and personalised than using plain envelopes. I’ve created a tutorial for you, which I hope will be very useful if you have any special mail to send within the coming months. It’s one of those tutorials which is very simple, yet extremely effective which is always a bonus for me. 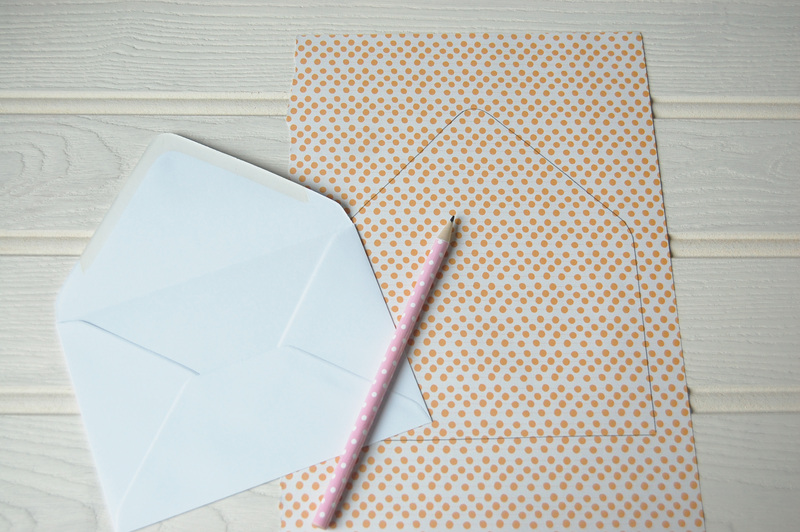 Place your envelope on top of the paper you have chosen and draw around it using a pencil. Take your scissors and cut out your template. 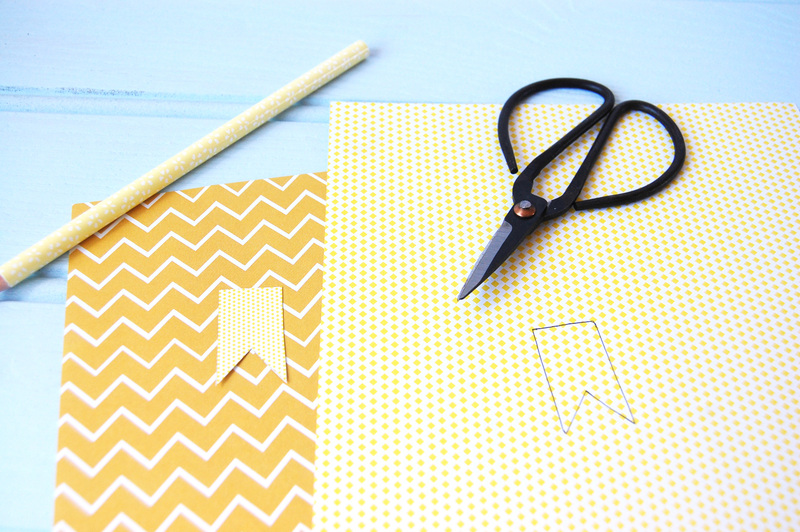 One finished with the scissors, use an eraser to remove any pencil marks. Slip the liner into the envelope to assess whether you are happy with the shape. You will notice that the liner is covering the adhesive part of the envelope, which we do not want. This is where the next stage comes in handy. Take the liner and position the top of it directly underneath the adhesive seal, ensuring it’s in line with all sides of the envelope. You’ll need to turn the envelope over, so you can use some blue tack at this stage to temporarily keep it in place. You’ll notice the excess paper at the bottom of the envelope. This needs to be trimmed off. Take your ruler, measure the excess and make yourself a straight cutting line. 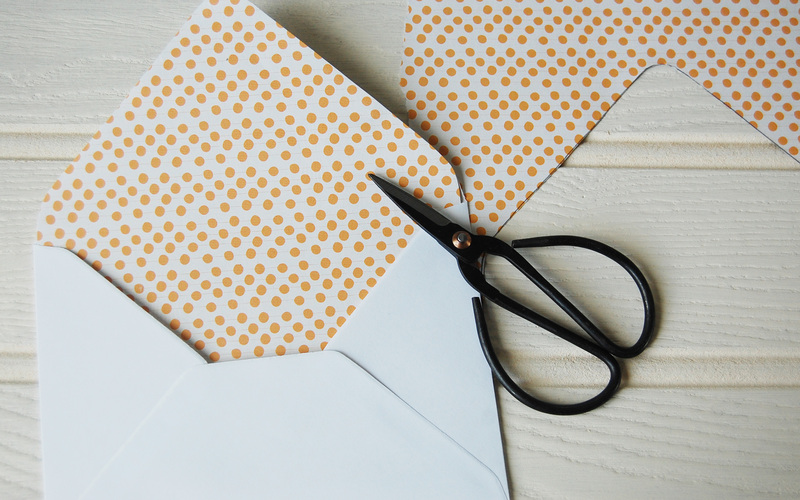 If you’re unsure about the measurement, just cut small amounts of paper off at a time and continue to place it into the envelope to check the size. Erase any pencil marks and remove the blue tack. Once you’ve trimmed the excess paper off from the bottom of the liner, place the liner into the envelope and position it. It should look like this. 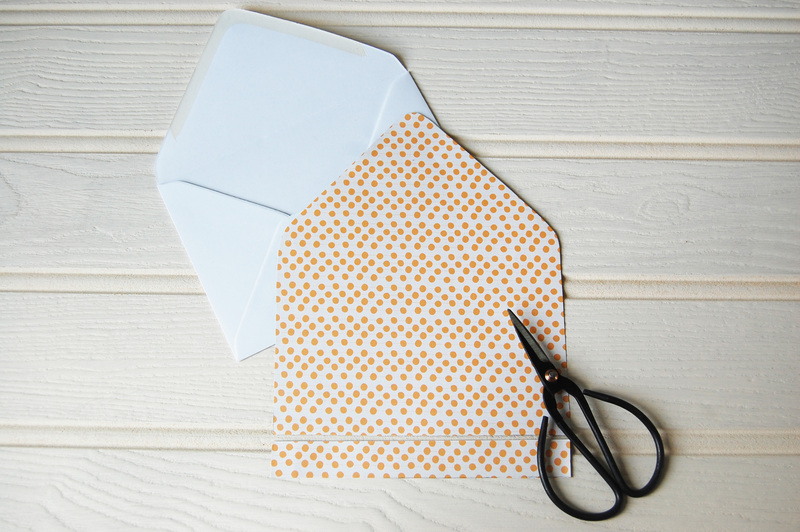 If you’re making a lot of envelope liners, then I would suggest making a template out of plain paper at this stage, which you can use for the rest. 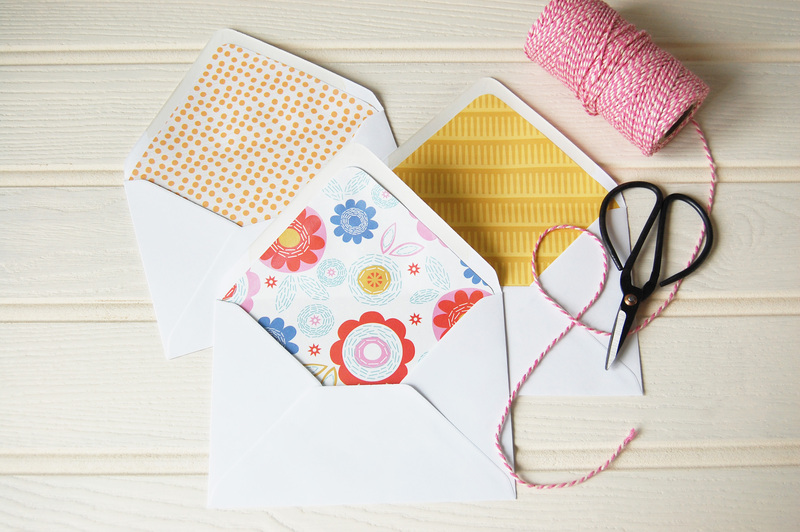 Keeping the liner secure, fold the envelope over as if you are sealing it (but don’t). You can use a ruler to score it at this point. Your liner should now have a sharp fold. 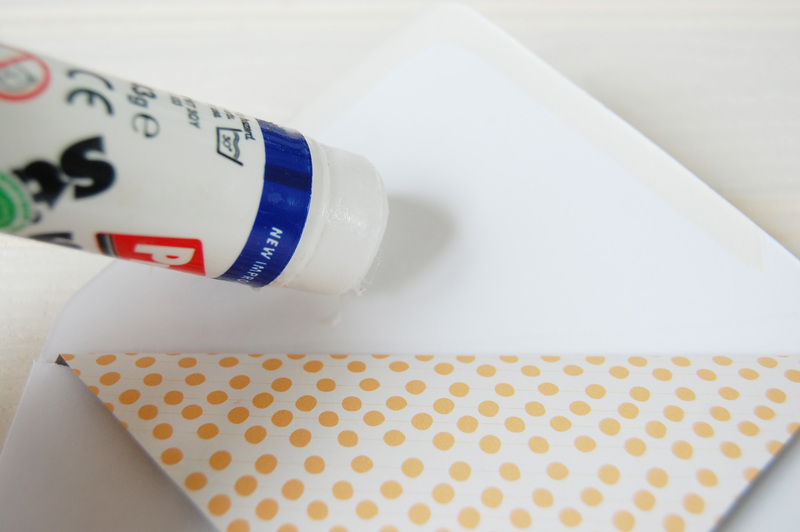 Take your glue stick (or double sided selotape) and glue the envelope as shown above. Position the top of the envelope liner over the glue and it should all match up nicely. 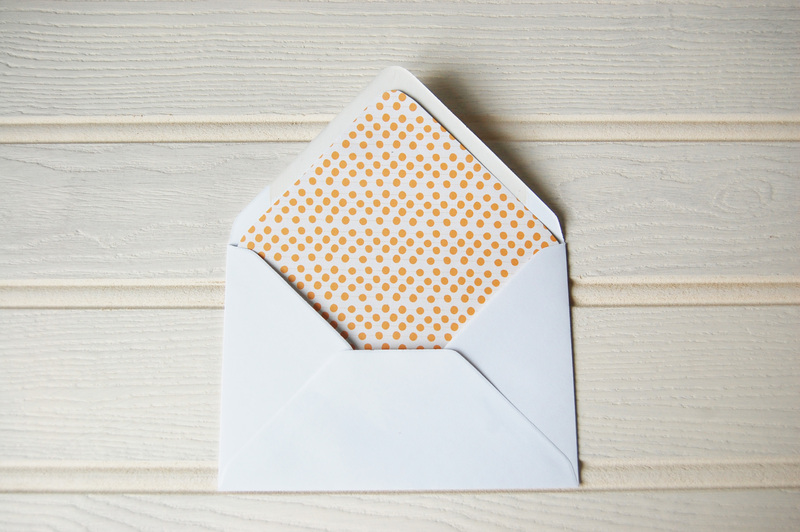 Rub your hands over the paper and fold the envelope over and back again just to make sure everything stays where it should. Voila! 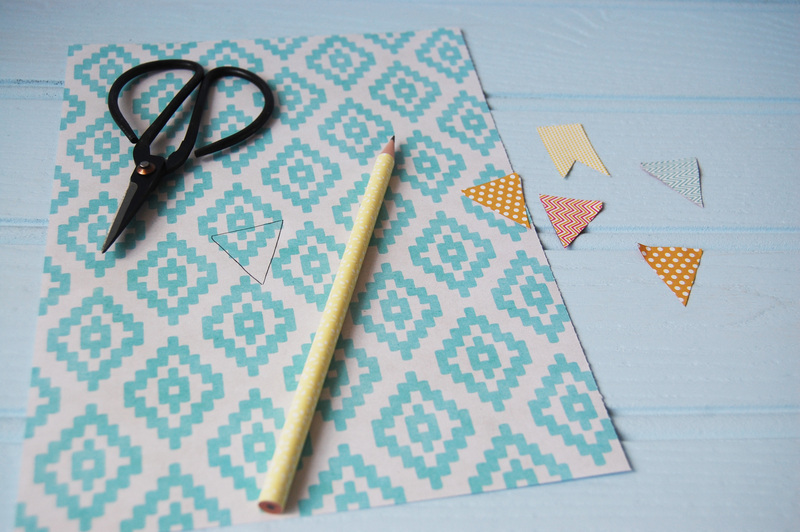 You have yourself a beautifully patterned envelope liner. 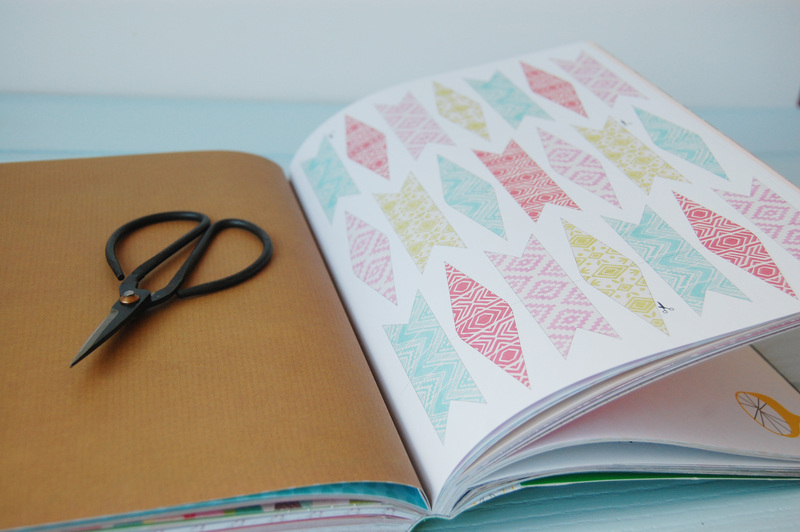 Don’t feel like you have to use the same paper either, you can experiment with different pattern and colour combinations and go wild! 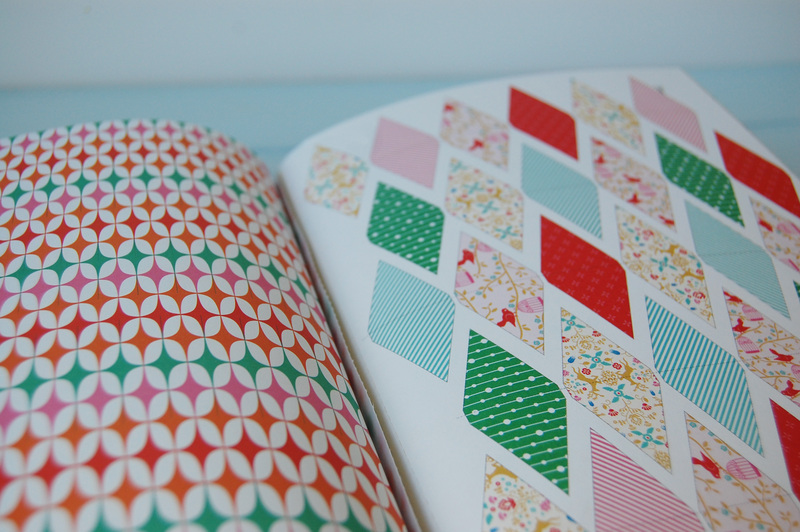 You may have seen my earlier post on illustrated stationery? If so, these envelopes are made for this kind of thing. At present, I have a small range of illustrated cards and I’m really considering offering custom designed printed envelope liners as an extra option. How amazing would that be? Do let me know if you decide to get creative and use my tutorial. I would love to know! 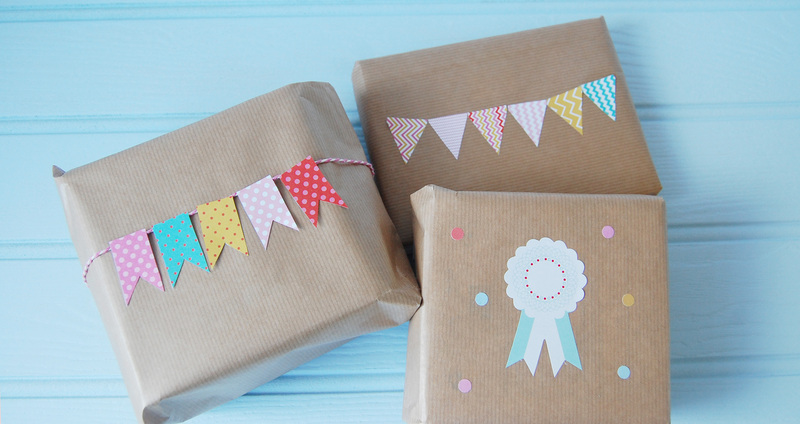 Do you have any special mail that you’ll be sending within the coming months? If so, have fun and I hope you enjoyed reading.